Update 25/10: I have now blogged about the larp Till Death Do us Part here. This August i joined a Nordic group in a culture project with the goal to travel to Palestine and to do a larp with Palestinians. Before that we spent a week traveling around Jerusalem and the West bank. Visiting both the amazing historical and biblical sites as well as the troublesome shades of black and grey that many times is not even hidden behind a curtain. The project was organised by the Norwegian organisation Fantasiforbundet which also hosted the Larpwriter Summer School that I visited earlier this summer. Jerusalem. City of impression. So much beauty. So much horrible stories. Met several people today in Sheikh Jarrah who have lost their homes to settlers. Inside a city that is within the green line of 1967 – and it’s getting worse. This is Nabil and his mother. Their house is now occupied by renegade settlers. Second day in Jerusalem continued as another day of remarkable contrasts. First a tour with the Israeli Committee Against Housing Demolitions (ICAHD) to show what problems are caused because of settlements being built inside and outside of east Jerusalem. I recommend everyone taking their tour if they are here. Also the first the I came up close to the “protection barrier”. After lunch I meet up with a Swedish friend and her two Israeli friends and went on a really nice ride to the Zoo. It was loads of fun hanging out with to quite liberal Israelis and hearing their thoughts about the country. This country is packed with contrast and contradiction. To be in a zoo watching closed in animals after seeing the what happens when you build walls through communities and strip away peoples rights piece by piece. If this is not apartheid I don’t know what is. At Sunday we went further into the West bank. We visited three sites in Jericho, amazed by the mosaic of Hisham’s Palace and the once again religious importance of the region with the monastery of temptation (could be important for you Bible people) and finishing with the ruins of old Jericho. 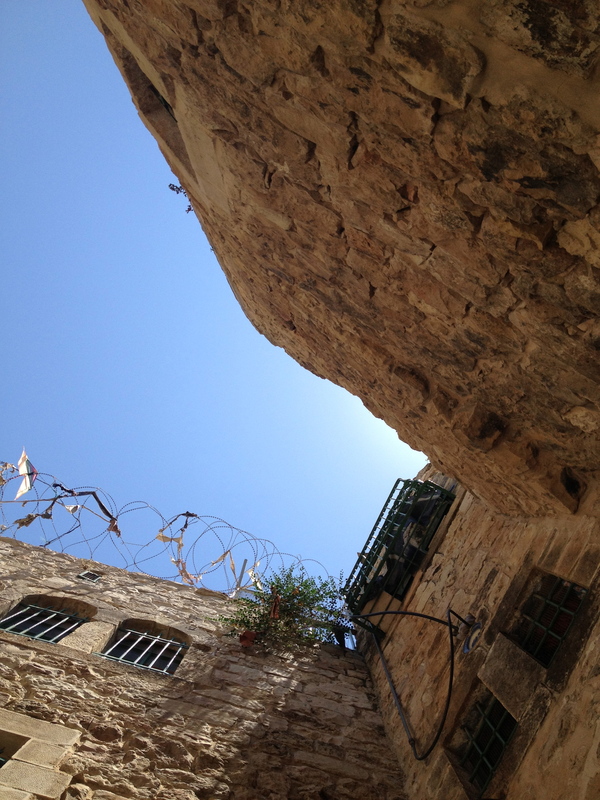 Just a 10 000 year old city… After that we went for a swim in the salty dead sea. Hot both in air and water but a fantastic experience with your body parts floating wherever they wanted. Between the trips I spoke a lot with our driver Said. Really interesting to continuously keep hearing the stories of people who live here. Among other things he knew several people who had been released in the prisoner exchange of the Gilad Shalit (1000 Palestinians for one Israeli soldier), and I have just barely touched the surface. Monday in Palestine started with a visit to the Swedish General Consulate in Jersualem. It was really interesting to hear about how they worked with West bank and Gaza strip that is it’s area. After a quick lunch back at the hotel we took the bus to Ramallah and crossing the barrier into the West bank. The environment is so different with the so called “refugee camps” that is like actual populated cities without law and infrastructure. 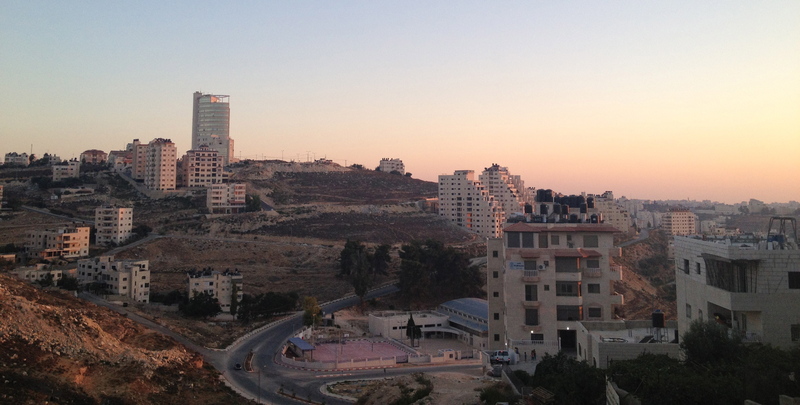 In Ramallah, the administrative center of the West bank, I hosted a Mobile Video Workshop. It was a great experience with about a dozen of participants. On the trip back I had my first experience of walking through a checkpoint. Even though it was no queues at this hour, the feeling was really bad. Still, the landscape was beautiful with a pink sun shining over both apartment compounds as well as guards towers and fences. 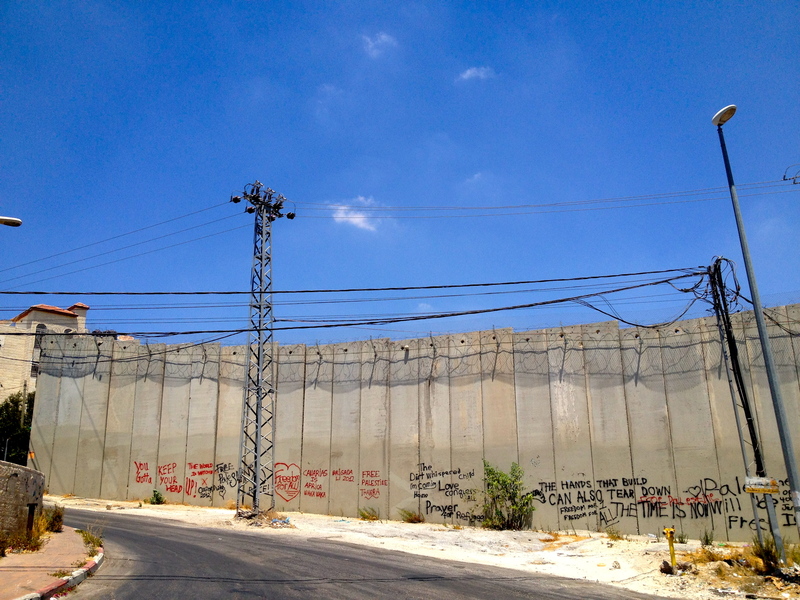 Tuesday was a day of seeing some hard realities in the West bank. 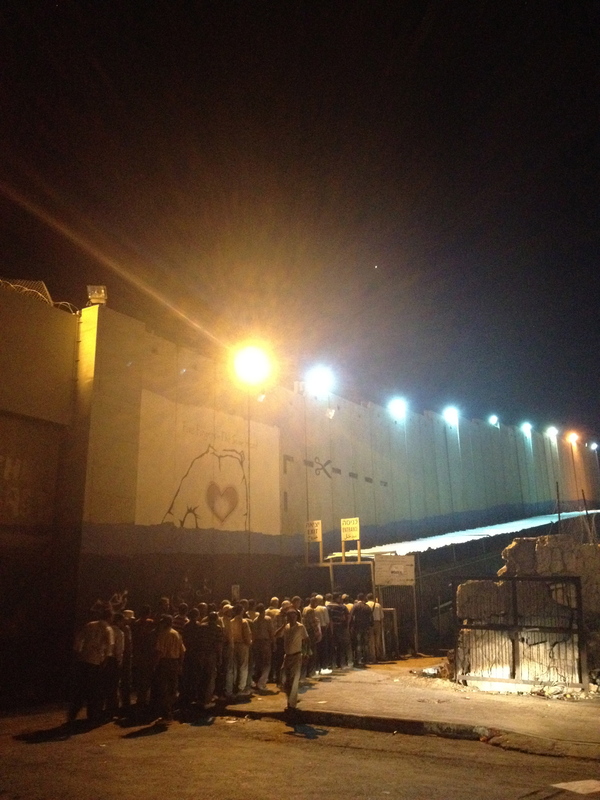 At 03:15 in the morning we left east Jerusalem to see how it is for the workers of Betlehem to cross their checkpoint. First we crossed it to get inside which was very easy and where then briefed but some nice people from the EAPPI – Ecumenical Accompaniment Programme in Palestine and Israel. Then at about 04:00 we walked crossed the checkpoint to get back through the barrier. An extremely caged in experience through long lines of waiting, passport checks and airport-like security scan. We where lucky, we went through in less than an hour. Checkpoints can be closed and waiting can be so much longer, hotter, crowded and more stressful. It is extremely hard to understand that some people have to do this every day to be able to get to work. Not a nice experience at all. Also the impact of the barrier has been big in other matters such as the closing businesses, a part from just the fact that people are caged in. The EAPPI works with being a watchdog over this checkpoint, reporting wrong doings and harassment. When in Betlehem we also visited the Church of the Nativity, supposedly the place where Jesus was born. For many an extremely holy place and common tourist attraction, and as the tourist we are, we could easily get through the checkpoint when we passed it again, in our comfortable air-conditioned tourist bus. A soldier came on board and walked through to check that all was fine, but we heard that the most of the times don’t even do that. After that we went north to Ramallah and my second visit there. At the office or Jerusalem Legal Aid and Human Rights Center (JLAC) we where briefed about Beduins living in the area outside Jericho. Apparently the group of 8 families (ca 40 people) who mainly live from herding of sheep where to be evicted from their land. This was being done by the Israel civil authority to clear out a big area around Jerusalem from Palestinians in a project called E1. While clearing the area, the goal is to build more settlements and connecting them. The effect will be a wide tail of joined settlements that will further cut off the access to Jerusalem from the West bank. And also making transportation through the West bank harder in general for Palestinians. We should all then just remember once more, that further settling on the West Bank is totally forbidden by international law. Hearing about it was one thing, the impact became immensely harder when we actually visited the Beduin families at AlKhan AlAhmar. Sitting there in their shacks on stony hills it is so hard to understand and grasp their situation. The Beduins used to be allowed to travel freely and herd on state land in Palestine, Jordan, Syria and many other countries. This group is now squeezed into a tiny spot next to a settlement, continuously harassed by settlers. Now the Israeli civil authority are trying to get them evicted to be able to build more illegal settlements. JLAC are trying to help the Beduins here and did successfully freeze the eviction order in court for now. But as orders are and law are written by the Israeli army, new rules are easily made up and fighting theses cases is extremely hard. The future for these families does not look bright. If evicted they have no place else to go to where they can continue their way of life and their culture. While the international community just sits by and does nothing. Israel continues to expand it’s illegal settlements, affecting the lives of millions. Thursday was spent mainly by visiting the divided city of Al Kahlil/Hebron. First we went to the TIPH (Temporary International Presence in Hebron), an international civilian observer mission consisting of a few countries watching and reporting about the situation in the city. The briefing was good and I got a wider understanding of the history and current developments in the city. Hebron is very special since it is the only city in the West bank with settlements inside of it, instead of just outside. This results in much tension from actions in both 1929 when about 60 members of the Jewish community where killed and in 1994 when Baruch Goldstein killed 29 Muslims during prayer in the Ibrahim mosque. Today the city is divided and separated in many ways causing much problems to the Palestinians, and while the TIPH only is observing it does not even publish its reports. It only gives them to the Israeli and Palestinian authorities as well as the participating countries (Norway and Sweden are two of them). This and the fact that they have no mandate to intervene in Israeli or Palestinian violations makes them very much toothless I am sad to say. After the briefing we went to the old city and were introduced the Hebron Rehabilitation Committee. It works with restoration of houses in the old city from which Palestinian families have left due to the troubles. When restoration is done the families can move back and repopulate the oldest parts of Hebron. With our guide Walid we went to see the Ibrahim mosque which is said to be the burial place of Abraham and his family and then off to be hustled by shopkeepers in the small alleys of the old town. Walid really wanted to show what was being done and how strange life can be when streets are closed making a 10 minute walk instead taking 1,5 hours. The economic decline has also been harsh as well as a lot of harassment by settlers. 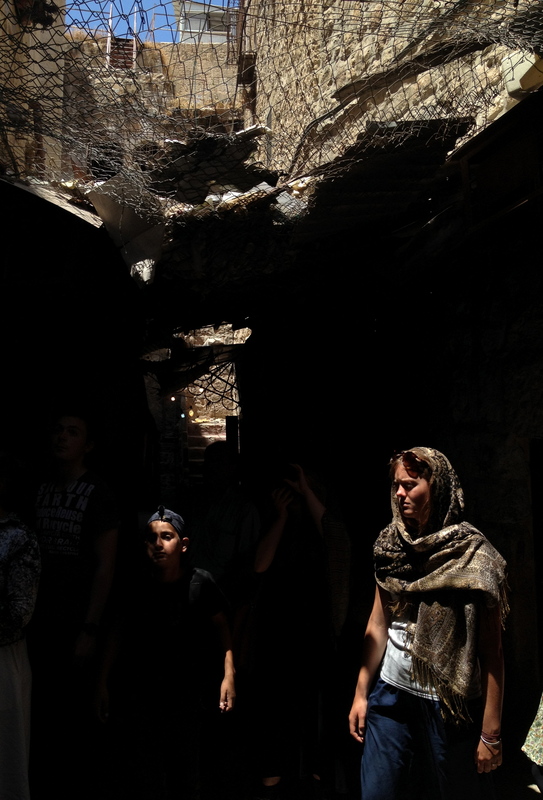 The goal was to show us life under the occupation but not only the dark stories. He wanted to show us that things can be done about the future and It was actually the first tour that was not completely pitch black. Our tour ended at the office of the the Representative office of Norway to the Palestinian Authority. Like at the Swedish general consulate we got a good briefing but I still got the sense that to little is being done. Instead of just stating problems when talking with Israel we could do much more in the Nordic countries. For example we should not on one day condemn Israel’s actions and then the next day do new trade agreements like we just have done. Massive suffering will continue unless the continuing settling in the occupied West bank is stopped now. How to solve all issues after that is still important, but please let your questions about that wait. I suggest that anyone who does not understand the importance of this to visit this place right now. A systematic apartheid oppression is taking place and we are all in the backseat watching. Read about the larp Till Death do us Part. Pingback: Nordic larpers rock | Thomas B.